#ProjectKazimierz presents Wojciech Burkot, with Richard Lucas and Sam Cook. Wojciech discusses his early companies, moving onto Google, and what he’s working on next. 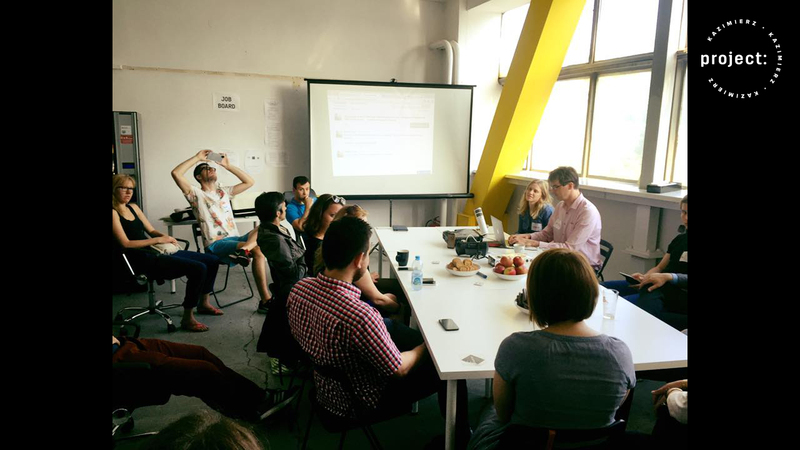 They examine the ways in which universities in Poland need to change and adjust to the blossoming tech community surround Krakow. Finally, Wojciech lends a few words of advice for those interested in journeying to Krakow and also to those who are already chasing the dream in Krakow. Hello again Project Kazimierz listener, my name is Sam Cook with my co-host here Richard Lucas, Richard hi. We are sitting here in Hub:raum on a wonderful Sunday afternoon in April 2015 here in Kraków right across the river from Kazimierz actually. We have a very special guest here that is well known in the tech community here in Krakow, Wojciech, and Wojciech I’m going to let you pronounce your name so I don’t, with my budding Polish ruin it and also just introduce yourself and just give us a little bit of a story about your background. All right, so Wojciech for France, everybody calls me that way, it’s more Wojciech in Poland. Background, I’m a physicist and I spent quite some time doing high energy physics in places like CERN or DESY in Germany and then I learned about large computer systems so I was able to move to the dark side of the business when the opportunity came. Leaving academia, my first company was AMS, with the guys from the external ads, the guys doing advanced financial systems and billing systems for telecoms for example. So I moved there as a programmer, consultant. After that it’s Motorola again starting from 30 people, growing it up to like 200 and then it grew even further and then it was Google. One of my employees told me that fitted the description they required in their job ad so I started Google Office in Poland. The first one was in Kraków, I helped spawn into the Warsaw one. After eight years I moved on and now I am CTO of Allegro, trying to convert that to a really cool tech company. Great, and Richard I’m going to bring you in here to this conversation because you are a 24-year resident here of Kraków and have seen it really start from the end of the communist era and changing. Richard just talk a little bit about what change you saw in the Kraków community when Google came in and also just when you got to know Wojciech here and seeing that transformation happen. That is a great question, Wojciech I think typically being quite modest about his background but I first met Wojciech in either Google For Entrepreneurs or for the Aspire organization. I can’t remember which to be honest but as regular listeners know I have been active in supporting entrepreneurship from my first day in Poland which was back in 1989 and for many years it was quite a minority pursuit and then in the last few years, as everyone who listens regularly will know the startup community has flourished. Part of the Google organization is Google For Entrepreneurs but I always say that people do business with people not with organizations and what happened in Kraków was Google For Entrepreneurs opened up a kind of community space as part of Google’s global program that the local leadership and I’ll let Wojciech give the credit rather than do it personally. It wasn’t just Wojciech but some people in his team, did a tremendous job of making this wonderful venue right in the heart of the city on the main market square on the Rynek Głowny available for community events and obviously for many people, Google is a much sexier logo than the President of the European Union. It really gets people interested which can be exploited in a very arrogant way, you let people line up to see you. Or else you say we are a representative of a key part of the transformation of the global economy and therefore come on in and use our space to help further your projects rather than steer it centrally. I came across Google For Entrepreneurs and Wojciech through it and again you go there and you meet the senior executives from Google, not just Wojciech but his colleagues. They just come by and they are not like lined up behind the secretary who is keeping people away. But absolutely Google For Entrepreneurs provided a space which I think accelerated the development of the local ecosystem and it was the right time at the right place under the right leadership, and I think perhaps Wojciech as well as talking about yourself there are probably one or two other people you might want to mention. I just answered the question. 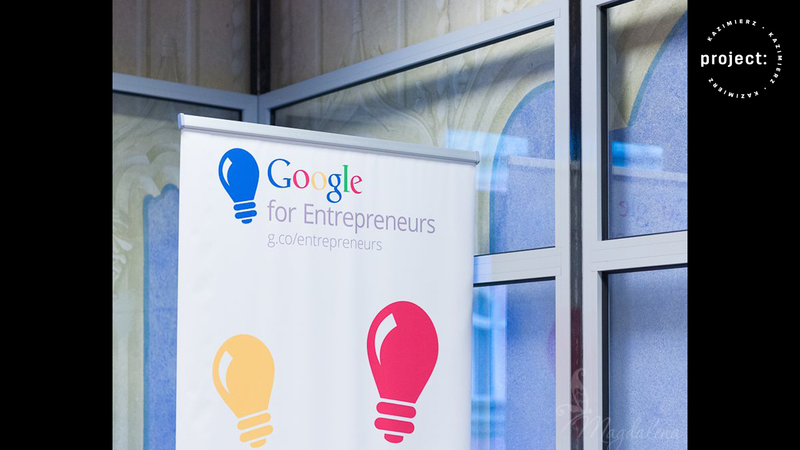 Of course Google For Entrepreneurs and its presence in Kraków is mostly due to the efforts of Paulina Mazurek and then there were other people joining from Google that relations managers community. That was Dawid Ostrowski. Two of them essentially run the space, run tons of events. Many of them sponsored by Google, some of them we tricked US consulate to sponsor, actually one of the best ones, which ended up then sending a couple of Polish startups to Tech Week in Chicago making waves with that. That was really great collaboration. As Richard mentioned, it’s people working with people rather than institutions right? The same institutions now close the door so we are thankful for hub:raum here for being able to meet under the roof. I think we interviewed Hub:raum and they like to be called Hub:raum. You have to say it very German for them. It’d difficult not to run into Richard. Well the director who let it happen and that in itself is a great move in having directors under you that had that initiative and then Richard who ran Open Coffee and still runs it at Google and now in a new location and then me as a consumer of that product that really kind of changed everything for my business. I see it as a kind of institutional entrepreneurship really and your ideal isn’t enough money or isn’t enough people and timing isn’t always good and I think this facility opened up by Google was just at the right time because it provided the space. But it was other people’s projects like Open Coffee Kraków project was Marta Rylko and different people, and we’ve had Mark Bradshaw who we interviewed a couple of weeks ago who does the Kraków life project, he came along to the first meeting just to support it because it’s harder at the beginning I think Piotr Wilam or Marek Kapturkiewicz each came on for the first meeting we just like got it going. But you need the space, you need the idea, you need the resources and sometimes people have got three of the four and even with a great idea, the great people and enough money, if the timing’s wrong, you are still screwed so it was quite fortuitous. The other thing to say is that there is a lot of kind of a issue about how to handle Google going north to Warsaw there is this historic rivalry of Warsaw and Kraków because Kraków was the capital. Almost as traumatic as the castle moving up to Warsaw. As a guy who was born in. It was an accident, right? I know there is a guy who was born and grew up in Oxford and studied in Cambridge, I can deal with rivalries but I think the key issue, as Dawid Ostrowski, who was also the Google developer relations guy said regardless it’s an opportunity to replicate what has happened in Kraków across Poland. Because if that way we build our brand and it’s very much the startup global network mindset but it’s not like win-lose. If there are a few billion dollar exits in Warsaw, that’s good for Poland, it’s good for Europe and it’s even like Skype, is good for Europe. One of the founders of Skype, Jaan Tallinn invested in one of my startups in London recently which … Vantage Power which I’m very happy about. The fact is we just need more global success stories. In fact even in Silicon Valley, a success story anywhere lifts – but we need that and so the hope is that we can keep the momentum going here, we don’t lose it obviously and maybe we have to try harder. It’s like, why was East Germany the most successful communist country in Europe? Because it was rivalizing against West Germany. Why was North Korea such a successful communist economy? Because they were competing with South Korea. Maybe that jolts the Kraków startup system. Can you talk about the startup community from the Motorola perspective and then, because like the startup community is kind of a bit separate from the big company community historically. And I think part of what you were doing with Andrew Helen who we are going to interview is to try to bring this big company startup community closer together that in Motorola and then later in your other positions in large corporate, how do you feel about the relations with the startup community? Okay there are certain things which happen in Kraków just because of those large multinationals. We are really backward, right and especially for Motorola it wasn’t so much concerned with the entrepreneurship and the startups however one thing which was normal in the large American corporations at that time meaning parity between, and the diversity of the company was natural, for Motorola, it wasn’t natural here. When working there I was really pressed to get 20% of women engineers. It was extremely hard just because there were like 3% of women engineers graduating from Kraków University in related fields. We started searching for the reason and it turned out that it happened about the second grade of the middle school at that time where the ladies were even better than men at their age group suddenly lost interest and hard sciences, math and anything were just needed for a successful career in the tech industry. That was one thing but then and it was a start. People were leaving Motorola and some of them really started their own businesses. The small scale, the valleys which actually created, Silicon Valley in a much smaller scale happened here in Poland thanks to those large multinationals, new ways of working, freedom of the choices for engineers, completely different model. That sort of brings the entrepreneurship and they help startup community. It wasn’t before the first of the large companies coming here. No, I’m not saying that it can create another Silicon Valley, the big forces in Silicon Valley is completely different. It was military initial startup, hi tech, hardware supported by the large corporations as well. If you trace how Intel started with all its predecessors, people moving from one to the other just to get more freedom in their work. That’s something which, at the universities, Stanford and its influence on the startup community it’s not here. Here I’m sorry to say that but I’m coming from academia so I can be excused. It’s a pretty futile system. So very little of the collaboration which is normal in western Universities between the professor and the student, nothing of that sort. 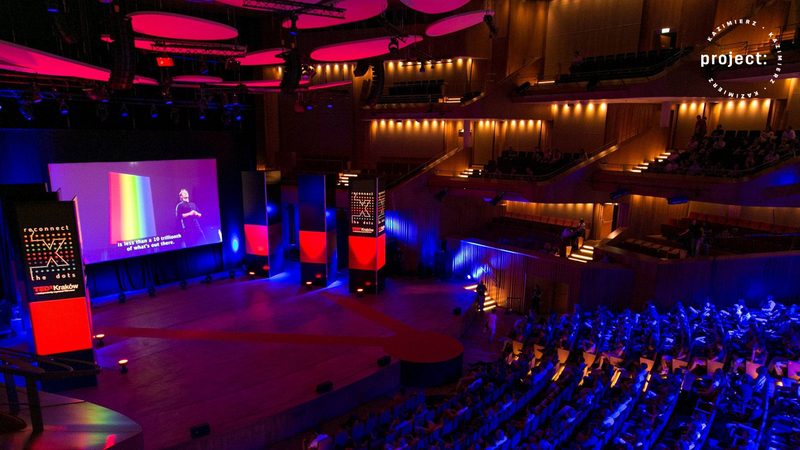 Although I want to just say that I have been supporting the AGH as the major local technical university, I won’t say “Akademia Górniczo-Hutnicza” because no one will understand that but AGH has its first TEDx Kraków…last week. There is something called AGH entrepreneurs now. Clearly, again this is fertile ground that people…waiting to happen. It’s not perfect but the way to move from imperfection to perfection is just to start the high school I went to in the UK Winchester College, started this Entrepreneurs Association among the alumni 630 years after its foundation. A couple of years ago under my leadership, so and we did it in Google London. You know all the universities were same for the proposals for industry are actually teaching relevant subjects. It was very difficult behind the iron curtain to get the news both in terms of the recent results and being able read through it or the actual practice with the modern equipment. That was completely different so it couldn’t start that way and it sort of petrified those relations in the universities and now since the input is coming from the other side, nowadays it’s easy to study in London, right? It’s very interesting the point you made about the international companies bringing in values of diversity because quite often Poland there is a… and also in America there are cartoons which I believe are modeled on Westinghouse who interestingly adopted Nikola Tesla’s technology so they weren’t always backward. But Westinghouse has built an image of the corporation being horrible, is one that is very much replicated in European culture that a big corporation is bad and of course corporations are like people. Well let’s say communism had the effect of freezing social development and communism was hierarchy very deeply embedded in the concept of how it worked, so Poland came with this very hierarchical tradition which the universities of course being quite conservative also represented and suddenly you had a situation where the managing director is wearing a t-shirt talking directly to employees, making meetings directly. Point of that actually that’s the normal and the Silicon Valley tech companies worked that way, right? Mark Zuckerberg, t-shirt and jeans, everybody else, Larry, Sergei of Google, same thing, they are actually engaging directly with the project. I fondly remember some of their visits to our office, engineers legos, crazy guys and crazy ideas and tried stuff and they were just active members of the projects right? That is something which is breaking those hierarchical rules and this is kind of self obvious right? Those are the companies who are going offshore from the US. Traditional companies aren’t offshoring anything but their shirt services. But getting to work abroad the core of your technology, takes that kind of thinking so we get like the pre-selection of those kinds of companies opening their offices here and employing programmers, designers for the success of their home branch as well. What about then there is a perception among some startup communities that sometimes the big IT companies, not just international ones but the very successful local ones like Comarch which has thousands of employees and is highly profitable, I always say highly profitable growing company. You can look down on it but I would love to have that problem. There is a kind of criticism that somehow they’re driving up the wages of people and this is somehow a threat to the availability of one of what some people say is Central European’s strength that we are relatively good value for money. What would you say to that perception? I’m not necessarily agreeing with it but I’m interested in your perspective. Well, I wouldn’t call Larry Page right now just because his – is coming from the closing of Krakow’s office but Google never came here for cheap labor. It’s something else, right? Now the pendulum went to the other end. All of people in that office got an offer to move the US which Larry thinks is a pretty generous offer. Or to Switzerland, or to Sydney. But it’s something else but you need to have to come for the project and making that outcome ended in something different. Still, the original concern against the concentration of Google was the concern of exactly what you mentioned, rising wages, getting difficult to bring people. If we don’t create a hub which is attractive for the foreigners here in Kraków, naturally it will saturate meaning the wages will go up which is … but you will not be able to get people to staff the jobs you have right? We have to build Kraków attractive and getting that through the environment in which multinationals thrive as well as small startups and when actually the movement is free. You pitch your idea to your boss and one of the tech companies of the region, they don’t like it, you go out, you do it on your own, you get bought back, right? It will happen, it will very clearly happen, and we started attracted people from outside. We realize that pretty early at Google and we made a conscious effort to get Georgians. You should get those guys. The quality of the university education they are getting, fantastic. Ukrainians, and even more popular I was mentioning Georgia is pretty exotic but you can see the pattern, right, strong math foundations, really good skills and yeah. But again Ukraine obviously and Georgia also were part of the former Soviet Union and maybe there is this central European concept or image based on some reality that the Soviet System was good at hi-tech, despite being a poor economy they were able to compete with the Americans in military technology terms. So there is strong sense of the STEM subjects, Science, Technology, Engineering, Math is a part of the Soviet tradition. However it’s not just intra ex-communist Europe migration. You get people from west Europe, you get people from America from all over the world coming and also intra-Poland migration, people come to Kraków from other parts of Poland and I think there’s a sense of critical mass because there is also a sense of security that if you go to your work for even on north—I wouldn’t name the names. But there were these business process outsourcing companies which maybe don’t have the most exciting jobs but if you are not from a very wealthy family, the security of knowing that you can go back to a job there if your startup fails or you are in a corporation during the day. And as Gary Vaynerchuck says, you go home from your day job, you kiss your dog, say hi to your wife… I think he said you kiss the dog, you read to your kids and then you do your startup from 10:00 pm in the evening till 2:00 in the morning, but this is the real life. Yeah, if I may add something, being a physicist really at heart, being a physicist I hate the term critical mass, right it’s meaningless. There is no such thing just between us there is no such thing. But the chain reaction is exactly the model for that so you’ve got something which actually can build on the existing whatever that is resource and create more of the same and in that way you’ve got into this exponential hockey stick kind of growth and that’s what you refer to as a critical mass, you need certain number of those integrations happening and then it can build on itself creating more interaction, more jobs and more startups. There is a nice example of a girl who is working on the podcast team, Ania Bywanis. I met her at Open Coffee Kraków on a Thursday, heard about her social project Hole Patchers, suggested she go to Wracław for a TechCrunch non-conference in Wracław she went to Wracław two days later, won the prize there, came back to Kraków, worked on the Kazimierz team and is now working for Sam as an employee. That kind of chain reaction is absolutely true. I’m going to add that, the project manager for project Kazimierz so she not only started with me, I’m putting her in the leadership roles of the company. 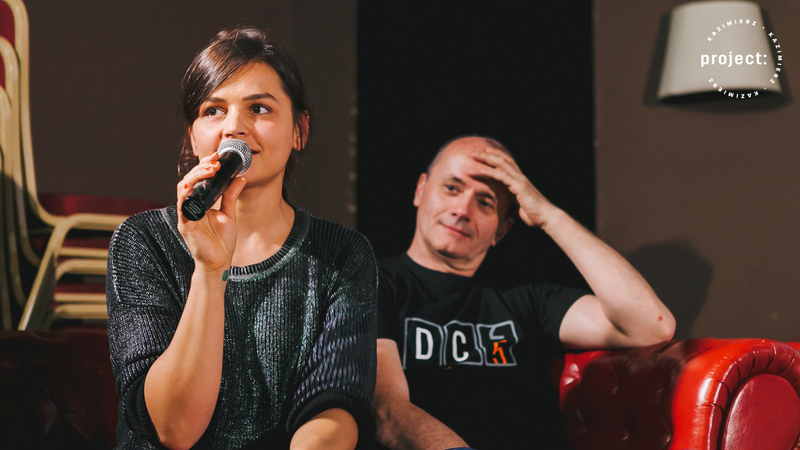 Absolutely and I think people like to work with talented people and that’s one, there are enough talented people, I’m looking at our studio audience, there are enough talented people in Kraków to mean that you can come here and it is not deeply Polish. There is many Polish talented people here but it’s not exclusively Polish. The next person we are interviewing today is a French entrepreneur who came to Kraków for personal reasons but the idea that you can meet someone from Mexico, from North America, from Zimbabwe, from even the small Island to the north of France called the United Kingdom and Kraków is part of the attractiveness. Any of your contacts, any of things you did outside of this group every workers group extends everybody else’s contacts right? That’s the interesting thing, that people, and this concept of zero sum game and rising wages and people ask me and every Polish person I meet says why Kraków and they can’t believe it. I know because I used to live in New York city in Manhattan and have by all accounts on paper a successful background in the US and could be successful in the United States and I know when I was travelling around the world, didn’t know where I wanted to live because I’ve been basically since I’ve been 18 I’ve been moving all the time in the army. I was travelling and I had no clue I’d end up in Poland but one of the things that people say, well why Kraków is do you like the cheap lifestyle, cheap labor, and I actually say, no, because my staff in the Philippines is a lot cheaper than Kraków. It is all about, there is no other city that I know of in the world that I can find every competence that I need and my team now is approaching 15, moving quickly to 20. I have developers, I have the best designers I have ever run into in the world. If you look at project Kazimierz website that’s Polish designed, made with love in Kraków. I can use some of that. Well, it will cost you Wojciech but I’m sure your company can afford it, and then. I think he’s going to invoice us. Exactly, how much is your hourly rate, but not just developers, which there are so many of them around here from all these universities but film crews, I have composers sitting here working on this podcast and audio engineers and Facebook ad managers, Google ad managers. All the people I need ironically I can find in Kraków and they’re the best I’ve ever worked with around the world including US people, US subcontractors. Now I’m sure if I really looked or maybe if I went to Silicon Valley I’d find a greater concentration of talent. But in all my travels around the world I hadn’t seen anything like it here and this strikes me because Wojciech you talk about, and your Polish sensibilities are betraying you here, you say, well we are never going to become a Silicon Valley because they had a special situation there whereas people like Richard and Ramón and people who aren’t from Kraków believe it can happen and I find this interesting divide there. Alright, really I was trying to be precise. You don’t want to and you can’t replicate what happened there. It doesn’t mean that you can’t have a concentration of people having these chain reactions and an expanding cake for everybody fast enough, so newcomers will get their first share of that increasing pie. On that level, yes it’s like Silicon Valley but you can’t exactly replicate what happened there because it will be different. There is a point about the economics of this and thanks to the European Union, and I think this is important, the outside model of government the European Union brought in was better than the Polish model of government. It’s not perfect but it’s better. There is this model of modern free market capitalism which it doesn’t actually have to be exactly the same everywhere. Poland is handicapped by a lack of capital, there is rising wages and rising asset prices starts to rebuild the savings that were wiped out by communism but we don’t have the deep pools of capital here that you have even in the UK, like in Cambridge, you go to Cambridge and there is probably 5000 houses worth more than $2 million and people can borrow against that. Kraków and Poland is not yet, we are not going to have that pool of capital but what you can say is that Kraków is one of these European centers where people… It might be Berlin, it might be London, it might be Frankfurt, it might be Hamburg but you get these places which are part of the system and there are enough people here to … and the money can just like fly around the world so fast now. You come to Kraków because there is a good project here. It’s just one of the places you can be but in terms of talent, I’m not sure it’s quite for the developers and startup community maybe yes but if you need senior marketing people who have got experience of working with international business, because the thing about Kraków is they’re ready to come. If they’re not here it’s nice enough because I had a nice experience on summer holiday two years ago in a historic city in Sicily called Syracuse. This was a famous battle on the edge of the Greek empire many hundreds of years ago but my children who have got all this trouble, these teenagers taken down on holiday in Sicily they said, hey dad this is beautiful, it’s almost as nice as Kraków. And I thought, what the hell am I doing taking my kids to the end of Europe that is almost as nice as Kraków? But this is also very important despite the bad air, is the physical quality of life here it’s quite exceptional, wouldn’t you agree? I would agree with that, yeah. Maybe just for those who are listening in maybe 100 years time you won’t know who Ramon is. The head of Cisco, a strategy director for Cisco in Central Europe. Cisco is I think creating more than a thousand high value added jobs here in Kraków so he’s a brilliant …guy. Yeah, and Ramon is another American who came to Kraków and realized the potential and built that whole new talent pool here in Central Europe really from the start. But he was talking about there is so much talent in Poland that still to this day. One of the reasons people say well why Kraków is like well we all go to London or the United States but I think one of the fascinating things about the Google office closing down in Kraków is a lot of the people don’t want to leave and despite the offer they got, they’re going to stay here. That to me is a very good sign of something that I think if this comes to pass, like Ramon and I were talking about is a reverse brain drain where the people who go to London, who go to New York, who get that ad agency experience and that marketing experience start to come back and you said this Richard that there isn’t that high level marketing talent. Well I run a marketing company and I do a lot of online sales, that’s my main thing and I actually am finding that talent. Would agree with you that it’s not quite there but I think there is a lot of hidden gems in Poland that are returning from places like Malaysia where they worked at Mindvalley which is a premiere publishing company that did a lot of great marketing. They are now returning to Poland and they are looking for something and I am snapping them up because I know that Kraków is not where it needs to be on marketing but it can be a lot quicker than I think that you think because of what I’m seeing and people like me and other people with outside expertise are going to come in as soon as the conditions are right and start doing that. But I think there can be a reverse brain drain if people from UK and Chicago who see these rising wages and the ability to make a good middleclass lifestyle that is actually becoming harder and harder in the United States and the UK and that’s why there is anti immigrant feeling and things like that over there and then also create this huge net influx of talent from Eastern Europe, the former Soviet countries that start…so when do you think we’ll see that Wojciech? Well, no debate. I do feel that the idea of yours, that having like a pool of 120 people who have to do something because the office has been closed, right? One third will go to the US, one third will move to Warsaw, one third stays here except that those who – US or other Google offices, all I talked with were saying that they are going to Twitter. It’s sad. I’ve heard that story before and for the first time I do believe that the change in the conditions here and actually the use for their talents here in Kraków might actually make that true. They will come back. That’s part of the chain reaction you were talking about, right? If you spread something which was tightly bound culturally in a sense that it was Google culture in that office, slightly different to the US one just because we were like different time scales. That was something which I’ve heard from Sergey Brin the other day when he visited back at Google offices, he said like, well, it’s like Google in smaller scale, more freedom, less structured, everything like this, right? I do believe that letting those people start their own things and you wouldn’t believe the ideas some of those guys have. Exactly and in today’s world it’s almost as good. There is this nasty term remittances which is the idea that people working in one country are sending money back somewhere else. I see this very clearly, I don’t know how much people are paid in Google’s Mountain View probably quite a lot more than most companies but they can easily be saving $7000 or $8000 or $10000 a month and that could be enough to fund a startup here. When I used to do workshops way back in the technical university AGH I would sometimes meet a complete lack of understanding of modern business and capitalism where a guy would put his hand up and say, well why should I accept investor money, they are going to want to make a profit from my work. And seriously this would be a well educated, this is a top technical university where the guy had no one in his schooling, no one in his family or no friend had ever taught him, this is a great deal.That guy is risking his money or that woman is risking his money and of course he wants to get more afterwards. But if you can make $1 billion and give $335 million to the guy who helped you, gave you money to make that happen, you are winning. These days that mentality is not quite well embedded in the concept of how the world works. The guy who his friend went to Google Mountain View says yeah I want 25% of the business and I will give you $10000 a month for the next year to help make that happen. That’s enough to make a business work I think if the idea is good, the timing is right and the execution is full and simple. Some of the blame goes to Martin hi Martin, I know you are listening. Some of the blame goes there. This funny little income which is necessary for that kind of investing might not be that high for people in Mountain View. Yes, Google pays extremely well but the housing cost, the education for kids is a lot. You were like upper middle class at least here working for Google in Kraków it would be difficult to attain the same relative level in any other place. Which is a great reason why it might bring people back. But actually I want to come in the middle lifestyle because there is this idea that there is any country in the world where it’s easy as a graduate fresh out of University to create the middleclass lifestyle. It’s just, the housing is always expensive relative to income when you are fresh out of university and it is for a guy who makes 5000 a month net which is like 1200 Euros net in Kraków. That’s a good salary for a graduate in Kraków, maybe not for a programmer but even for programmers. Yeah but it’s not easy to get a deposit for a house on that kind of salary and like you have this image of the TV perfect family with the dog and the two kids and the large house and the big kitchen. And I know as an entrepreneur who has like the companies I’ve helped fund and they are belonging to me exclusively have perhaps $30 million revenue or $40 million revenue, I still have huge problems getting a bank loan because I don’t have a job with Motorola. It’s actually true, it’s interesting but maybe I’m a risky person to not do business with so there may be a reason. We’ve got a special file on you Richard Lucas at the bank. Let’s say at Kraków, Kazimierz, Poland, this region country is in rapid transition and where we are now is different from where we were three, four years ago. What do you think needs to change that it hasn’t yet changed in terms of the local ecosystem and what should the people who come to Kraków for the first time be looking out for as signs of success just looking forward because let’s say we can bank where we are now. We can be complacent and say it’s awesome or we can work on the next challenge. Obviously the second options is better than the first but what are the challenges? We keep trying, we did that before, yes of course. Right so that’s one thing. The other thing is what you kind of mentioned before. It’s relatively easy to get the seed money for startup using European sponsors, and people like Richard who invest in startups and so on and so forth. But it’s also kind of easy if you look at the idea which is proven and it’s just a matter of commercializing that.There were certain things which you can have access to government funds or have access to easy money it’s kind of easy but we miss this middle ground like the third level, C level funding, relatively large sums, that was difficult, so getting the local venture fund who could know what they are doing is great and being able to invest that kind of money is something which didn’t happen yet and that’s obviously speaking for the growth. Yes I think he did mention the government yet and clearly the government has a coordinating role as well and there are some bits of the local government ecosystem which are actually quite smart and sensible but they are rather held back by a lack of network effect within the different government agencies but there are different initiatives there for sure. It’s very important people like you and Sam coming in and different people to just like say there is a different way of doing this and for example when at the open coffee meetings every now and again someone from the city hall or from the county administration shows up. I always point them out and say to everyone, give them a clap because for us it’s great that they come to our meetings rather than the old way of doing it, they would call a meeting in the town hall where there is no parking at 11:30 in the morning and like serious business people want to leave their office wait 40 minutes in the traffic getting to a meeting where not much is achieved. And if they come to our meetings they start pulling up the universities, the financial institutions, the government, anything else that you think would be important for the long term? I think if we can have those four, three you mentioned, that would get us to the next level. Yeah, I’m going to mention one more thing which is getting entrepreneurship education into schools because in the long run this is long-term. Getting economics education in schools. Would you believe that kids up to the university level they don’t have a single word of economy, personal finances, how to deal with money. Economics education happens by grandmothers and grandmothers can be quite good because they tell you to save and Poland does have quite a strong saving culture which is an asset, not the credit card American consumption isn’t always, although by no means all Americans are victims of that. It’s how they fund their startups, it’s credit cards. The other challenge is the trust culture where the first phrase I learnt in Polish is, “Nigdy nie wolno nikomu ufać,” which means, “You can never trust anybody EVER.” This was like the part of the asset of this ecosystem of tech, and this is not just a Polish or a Silicon Valley thing. Also in London it’s exactly the same. The tech community is an outlier where people work on trust and most of the business ecosystems you just want a favor and you are looking for a finder’s fee. I’m going to introduce you to my property deal, now where’s the money, whereas in the tech community this is feeling that you can’t keep information down and like we’ve started to happen in Poland and Kraków this trust network. I do believe that it’s a very, very good illustration from the time that we organized those campus for a participation tech week. Initially there were some startups which were actually reluctant to talk about their ideas in front of other startups so those ideas do not get stolen. And then it took us, I would say us and some others lots of preaching to get to their heads that essentially ideas are cheap, right, execution is everything. If you have similar ideas just work together there is a chance that there will be something good out of it. I love when you meet someone who says well I’ll tell you about my idea but you need to sign a non-disclosure. I had a very experienced investor once tell me don’t do that because when an investor hears that they want a non-disclosure agreement they are just not going to bother. There is nothing new under the sun really, it’s just a question of execution 95% of it. These MeetUps, like the Open Coffee one thing is important to be very respectful of the guy who shows up in one of those meetings not knowing anything because everyone didn’t know anything at one stage in their lives. And the fact that they’ve bothered to show up to a meeting means they are interested in self improvement and development. It’s one of the challenges you get a highly experienced entrepreneur leaving a meeting and someone puts up their hand and says, why should I care about making a profit? And it’s just like is it appropriate for this leading international business person to be teaching an educated ignorant 22 year old the basics of economics? On the other hand I think yes it is because if a senior business guy tells it to that guy in front of a crowd, there might be a lot of people listening thinking, hmm actually it isn’t that simple, right? I always say to the startup guys who approach me, you asked me what I think and I say I’m not really not interested what I think, I only hear what the customers and the users think because if you are doing this for ski resort owners, like there was a guy talking about flying drones over ski resorts and filming them. He said it’s not going to be a problem to get them to pay me to do that and I was saying well, give me their names and phone numbers and let them tell me it’s not a problem because I don’t care what I think. He said, but it’s a cool idea. I said, let the users think it’s a cool idea, you just need to keep on with the same cycle right? Wojciech I think that anyone who has listened to this episode is going to get just a great amount of ideas from you in terms of not just how to conduct yourself as a startup but more importantly the ecosystem here that you helped build in Kraków with people like Richard and Ramon and the rest of the community here. So, any final, if someone was listening to this and they are young thinking about starting a business. What’s the final though you’d leave someone with as a former head of the Google office here that what’s going to be watching the startup community here in Kraków whether they are here or somewhere else, what is the last piece of advice you would like to leave someone with? If they are somewhere else, well come and see for themselves, right? There is a certain level of security in the sense that there are plenty of companies and positions, plenty of startups doing cool stuff so you will find yourself comfortable. 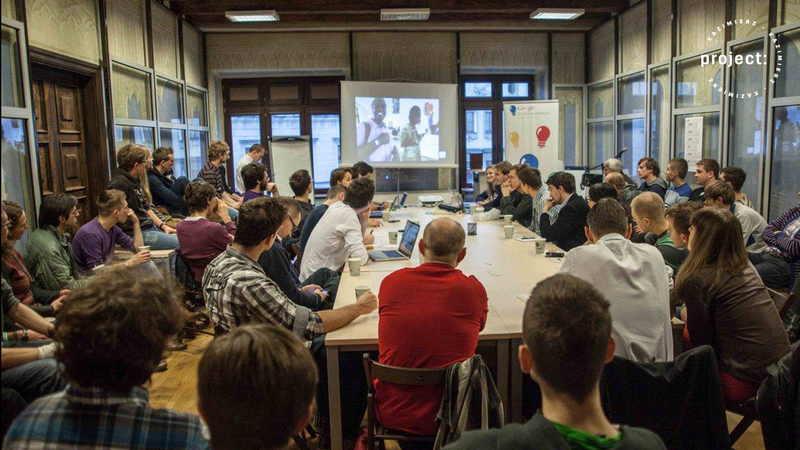 If you are local, just continue doing what you’ve been doing so far, let’s grow this community together regardless of whether there is large multinationals or the small startups or if you are in the academia somewhere in one of the Kraków universities, we need you, we need you all. So get involved, come to the MeetUps with Richard. Come see me, come see Paulina Mazouri. Richard I think one of the themes has been Open Coffee and just what Google did, it’s no longer at the Google office but for those of you listeners who want to know how to get involved who either are here in the community or just got on a plane and flew here because of what Wojciech just said, where do they find you, the Open Coffee? Or just Google Richard Lucas. It eliminates the need for memory. Alright and thank you again listener, project Kazimierz listener for listening to another episode of Project Kazimierz podcast radio where we are exploring the history and future of innovation in Europe and I like to say history and future because innovation started here in the Polish–Lithuanian Kingdom. It really spread a lot of great ideas throughout Europe and then it’s coming back now with a vengeance and I think this place, Kraków and Poland has a real potential to be its own Silicon Valley, its own future hub in Europe of leading innovation because I think every continent has one and Europe needs one to emerge as a leader and that’s what we are looking to build here.